Hematite deposits are mainly sedimentary in origin, rarer than magnetite bearing BIFs or other rocks which form its main source or protolith rock. Research and utilization of low grade iron ore plays an important role in the whole beneficiation process. The main beneficiation process includes gravity separation, flotation, strong magnetic beneficiation or mix several beneficiation process, and magnetization roasting and then weak magnetic separation. Hematite ores are harder than magnetite ores, and therefore require more energy to crush and grind if beneficiation is required. Hematite ores in large lumps should be sized into required dimension through primary crushing and secondary crushing. Grinding process would also be conducted if necessary in the following steps. Many factors would influence the performance of shaking tables, such as slopes, stroke, frequency, amounts of washing water, characteristics etc. in order to upgrade the concentrate, one stage of cleaner is used and the cleaner middlings are re-ground and mixed with rougher middlings for magnetic separation. 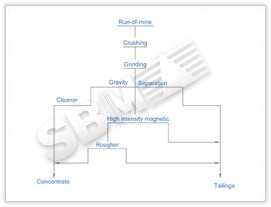 Since the iron contents in the rougher middlings and cleaner middlings are high, and the particles size of the cleaner middlings is relatively large, you would use high intensity magnetic separator to process the mixture of cleaner middlings after regrinding and rougher middlings. Open-circuit flotation process is adopted and corn starch is used as depressants, CaO as activators, LKY as collector. Concentrates and tailings obtained after one cleaner and three scavengers are greatly upgraded.